With the introduction of our new CNC area, and the surge in CNC use for the home production of panels, it seems appropriate to speak to one of the members who has experienced CNC first hand. I have had the excellent opportunity to speak to Wendy who many of you may already know and seen posts within the forum of the excellent work she has acheived on the CNC. I have arranged a selection of questions which Wendy has very kindy answered in precise detail for us, right down to what is a CNC. I think the possibilities are huge but comes with a price and preparation to read a rather large instruction booklet for a period of time followed by many failed attempts before you can produce anything that looks remotely like a flight deck panel. That being said, wendy is someone who has started from the bottom and worked up to gain exceptional skills on the CNC and producing some truly exceptional panels. A CNC machine is a machine that can move his tool along 3 axis. Forward and backward, left or right and up or down. It can move his tool with a combination of these directions and do it very precise according to the drawing you have made. CNC means COMPUTER NUMERIC CONTROL. So you need a computer to sent instructions to the machine. In other words the machine is driven by a computer. The CNC translates these instructions in movements along the 3 or more axis. A 3 axis machine has minimum 3 steppermotors which are controlled by pulses sent by the computer. Every pulse moves one of the steppermotors a small step in the commanded direction. The series of pulses that go to the steppermotors will let the machine move along the 3 axis and describe a path that will be the part that you want to produce. Engraving is only a small part of the capabilities of a CNC machine. You can indeed cut parts, cut grooves or circles, flatten certain parts of the material and last but not least it can also make 3D objects and printed circuit boards, even double sided. How long have you had the CNC now ? I have bought my CNC in September last year. During the first few months it was difficult to get results. After I changed a few things and learned a few techniques things improved a lot. I’ll tell you about it later. Did anyone help you on the setup ? Just after I purchased my CNC it was FS Weekend. Great fun, I also talked to different builders and there were a couple of CNC machines presented. One kind gentlemen had the same as mine. You all know him from the forum here, Hessel. He’s a real expert and he gave me the first lessons in milling. I’m so thankfull for his help. 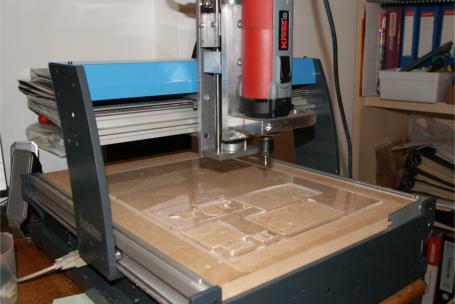 Did you build your own CNC, follow a pre made tutorial or was it purchased new/used ? At first I was planning to make one myself so I’ve search the internet for information on building a CNC. My first purchase was a book with plans from David Steele. As the book and the plans were good I did not have the tools to construct the necessary metal or aluminium parts so the search continued and I found other websites that offered ready made Z-axis, linear slides and much more. In fact everything you need to start building a machine. So it seemed to me that this was the road to go. But another problem that appeared during the planning phase was the accuracy the machine has to have. If It had to do very nice engraving then all the moving components had to be made to a tolerance of at least 0.05 mm and possibly even better. I don’t say that this is impossible but again you need tools that can handle this tolerance and equipment to measure that everything is to tolerance. In addition to this, you have to build a strong machine which cannot twist when it is cutting parts. Taking all this in consideration and the time that is needed to build one, I decided not to build one myself for now. I still have not dropped the idea of building a bigger machine later, it should be possible using my current machine. At long last I decided to buy a Colinbus factory build CNC that was offered as a kit. This means that you have to build the machine with all supplied components according to the instructions of the manufacturer. 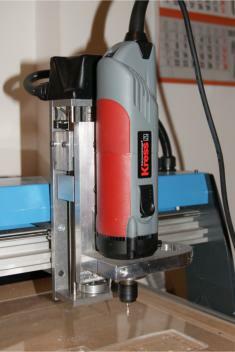 After the first tests I changed the mounting of the router on the Z-axis and mounted a Kress 1050 router. This was a big improvement and contributed to my current engraving results. So the Kress was a big improvement, what was wrong with the original router ? The router that was delivered with the machine was a Ferm. I later found out why I could not do any engraving with it. The reason of this is a lot of spell on the axis. That’s not the thing you want when engraving. Because I still had a Dremel without any spell, I decided to give it a go and mounted the Dremel on my machine. The engraving improved a lot. Problem here was that the Dremel could not be fastened enough to stay in place when using higher feed rates. 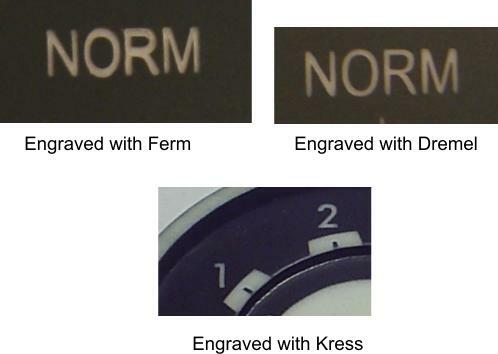 So at last I decided to buy me a Kress router and that was a very good decisionIn the pictures below you can clearly see the difference in engraving. Did you decided on a CNC so you can freedom with the parts you can produce or was it to satisfy the cost issues associated with purchasing every panel separately for the sim. Perhaps there a different main reason? But as I said before a CNC can make all kind of things. I can now make panels, buttons, cut gears, make anunciators and everything I would love to make myself and I can make these parts whenever I want and all that from a little bit of acryl or pvc or wood or… whatever. The freedom to cut and produce my own parts was exactly what I was looking for to build my own cockpit and I am only limited to what I can draw. What are the costs associated with a CNC ? 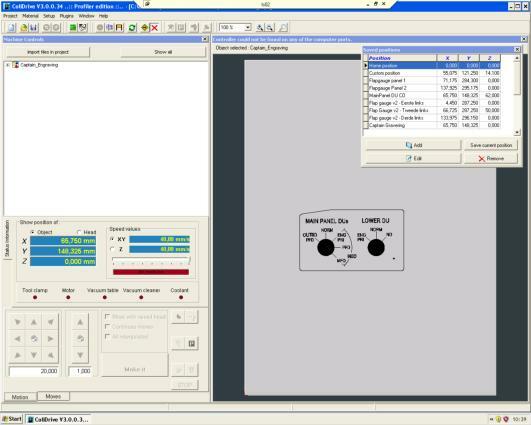 Apart from the CNC itself you also need software for all the different cycles in the process. autocad software, toolpath software… my machine comes with software that is used to position the drawing, set the tool, decide which parts to mill from the drawing. For some other machines you possibly have to buy this software to. As I mentioned before a quality router is also something that you need, I can not emphasize enough the importance of a very good router. Buy a quality router. 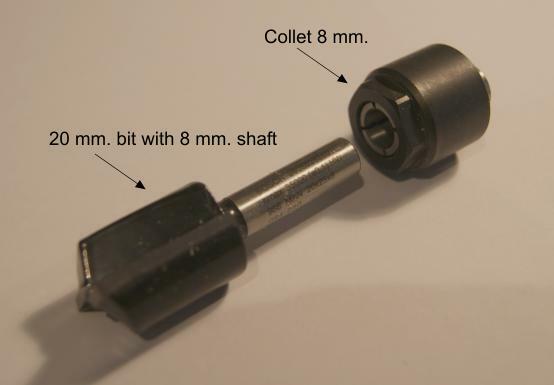 Then you will also need a small collection of different types of bits and collets (the nut that holds the bit). You also need collets for every bit shaft diameter that you are using. 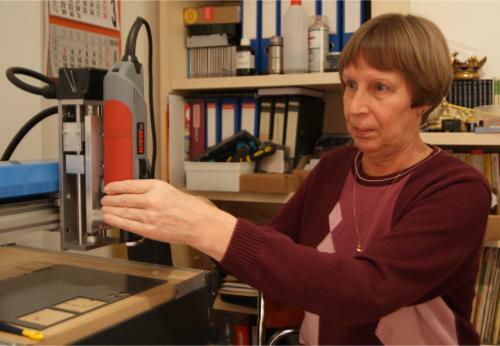 What are the maintenence costs and procedures associated with CNC engraving? The only thing actually is keep it well-oiled and if you are careful with the milling bits and don’t let the machine break them, the costs are practically zero. The bits are all very small ones, some have only 1 mm.. So if you are not carefull with them they will break very easy. 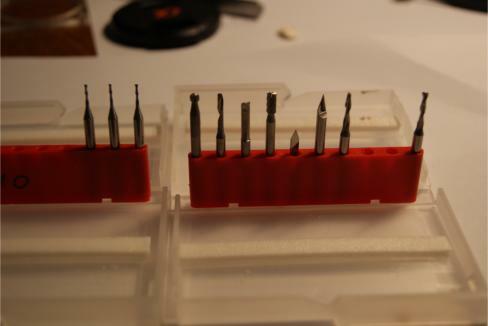 Engraving bits have only 0.2 mm so you need to handle them very gently. For the moment I’m working on everything that is needed to build my MIP. 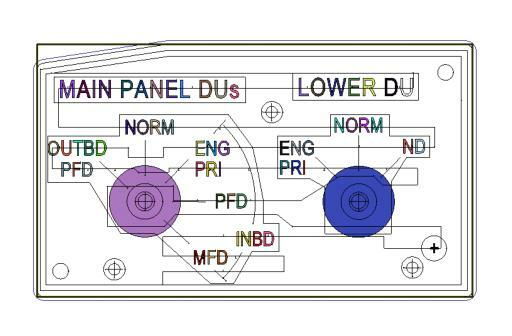 That will include all special things like switches or annunciators or display bezels. What have you managed to achieve with the CNC so far ? Kind of different things. Because I’m building a 737 it’s all 737 stuff. I’ve made FireWarning and MasterCaution buttons, AFDS panel, Flapgauge with 2 needles and the last one DU panels. I really enjoyed all this, each piece is so different from drawing to cutting and assembling. Did you have any prior knowledge about CNC machining or anything in that area? No I did not have any knowledge about CNC other then that these machines existed. Maybe what helped me trough the starting process is that I’m a programmer and have an electronics background, so I could easily understand the relation between software and driving the machine. Was there anyone that inspired you or encouraged you to go for the CNC route? Well actually it was my own decision, tought I must say Phill’s panels have given me the push to go through with it, even the fact that I knew Phill did not have a CNC at that time. After I purchased my CNC I had some help from MyCockpit member Hessel who took me to a quick take off. I was very happy when he offered his help. It is a time consuming process. There are different ways to do it but I’ll explain my method. First you have to find a good picture or drawing to start your panel design in an Autocad software package, this is software where you can make technical drawings exactly to the dimensions you need. During drawing you will have to take into account the potentials of your device and adjust your drawing as such. Below you see the drawing in cad-design. Next the saved file from the autocad package has to be imported in a software package that is capable of calculating and drawing tool paths. In other words this software is going to draw lines around or inside objects, according to the tool you have set, and is showing exactly what the CNC machine will be doing. Every cut is handled separately and you decide how deep and with which tool the router will work. From these tool paths the software generates code to drive the CNC machine. These generated codes have to be compliant with your machine. Now it’s time to paint the panel and let it dry. I’m using a paint that dries very fast but I do prefer to let it dry a week before any engraving is done. 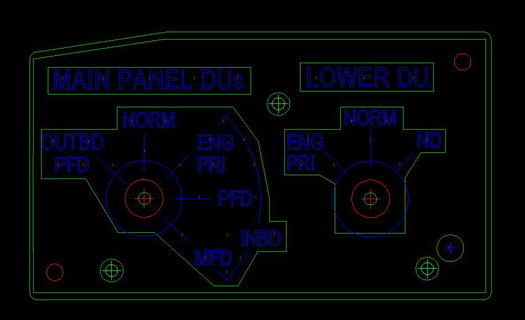 The next CNC step is engraving, start by placing the panel at exact the same place as where you did the cutting and start engraving. Eh voila your panel is ready to be populated with switches or whatever you want. Did you expect to achieve the results you got from the panels we saw on the MyCockpit.org forum ? Not at first, I only managed to cut nice materials to scrap, very discouraging. Almost thought of selling the damned thing. But once decided that I want to learn something then there is no stopping anymore. And the more you work with the machine the more you see other possibilities and you’re of. I now “love” my machine. On a final note i'd like to thanks Wendy hugely for the time and detail she has put into the questions. I'm sure many of you have found Wendy's work an inspiration and of great interest. I'll lookforward to hearing progress of the CNC.